If you think Branson is only about warm-weather fun, think again. Branson is also ALL ABOUT CHRISTMAS. Starting on November 1, all of the shows discontinue their summer programming and begin featuring all the music of Christmas. Red and green costumes abound, and often a huge Christmas tree takes center stage. 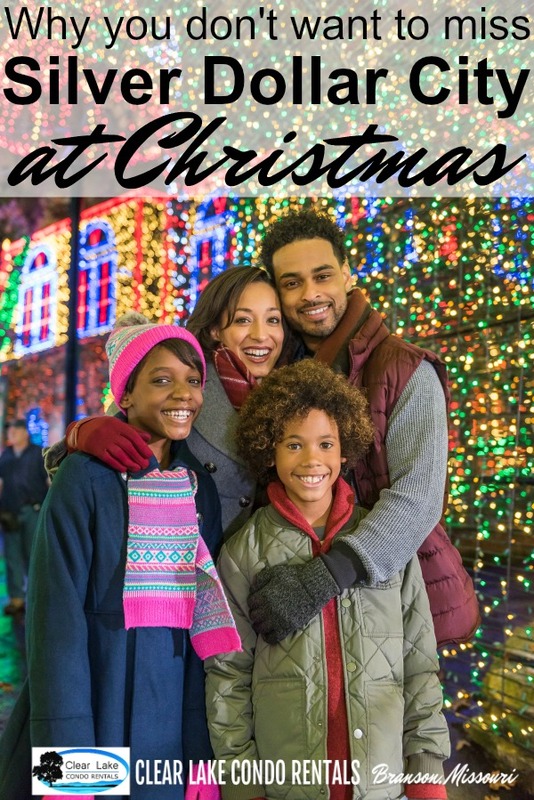 Also, lights and decorations are hung all over town, and the annual Adoration Parade on the first Sunday of December culminates in the lighting of the sign and Nativity on the cliffs above Branson Landing. It's all about the lights!! Silver Dollar City is known for stringing up more Christmas lights than you can possibly count in a month of Sundays. And this year they've added EVEN MORE! 1.5 MILLION MORE, to be exact!! The Travel Channel calls it "The Most Illuminated Park on Earth" for this very reason! Not to mention the FIVE-story-high Christmas tree in the center of Midtown, around which there is a nightly celebration for the lighting of the tree. Music and lights are choreographed together for a really stunning effect! Oh, and did I mention the Christmas light parade?? Twice every evening Rudolph leads lighted floats and fun characters through the streets of the City. The kids LOVE this! The Christmas shows at SDC are phenomenal. During the Christmas season, Silver Dollar City has two theater productions which I just LOVE: It's a Wonderful Life and A Dicken's Christmas Carol . Both of these plays are done really well -- costumes, sets, music, dancing -- and you sit enthralled waiting to see how Scrooge deals with those pesky ghosts and whether George will decide life is worth living again. And both of them are indoors, so if it's a bit nippy outside, they offer a wonderful (haha, see what I did there?) excuse to sit inside and warm up! The Hot Chocolate is TO DIE FOR! I'm totally serious! The hot chocolate at Silver Dollar City is better than any I've ever had. And it feels so warming and comforting -- and Christmassy! You can even get it with a peppermint stick that melts into the drink and gives it just enough minty flavor to make it interesting. SO. YUMMY! The rides are open AFTER DARK. Which for my family is the most fun thing of all. You only get to ride them after dark a handful of nights during the summer, but over the Christmas season -- especially since the sun goes down earlier -- you can totally experience the roller coasters and other attractions without being able to fully see where you're going!! It's a LOT of fun! I love seeing the stars between my feet when the Giant Barn Swing lifts me up high! Frankly, Silver Dollar City is one of the BEST reasons to come to Branson at Christmas. If you haven't experienced a Silver Dollar City Old Time Christmas yet, you will want to put it on your calendar for next year. P.S. Did you know that Clear Lake Condo Rentals is RIGHT NEXT DOOR to SDC? We are the closest resort to the park -- which means you can avoid all the traffic and sneak into an SDC parking space within literally THREE MINUTES from closing the door of your condo. And we currently have the only INDOOR POOL (and a splash pad!) on this side of town. So when you plan your Silver Dollar City Christmas vacation, be sure to give us a look! Click here to see our beautiful condos near Silver Dollar City and to check availability!